Penang was shrouded in gray when I looked out the window. I went back to my book, resigned to the fact that there’s nothing I can do to change the weather. The plane’s descent seemed to take forever, the landing bumpy and for lack of better term, swerve-y. Soon enough, I was stamped back into Malaysia and driving through highways and streets made familiar by my previous trip. The rain poured in earnest as we were driving towards Georgetown, where I’ll be staying for the next couple of days. I decided to go back to Penang because I felt I missed a lot when I hurriedly left the island last June. This time, I’m taking my time to get to know the city. The rain didn’t let up throughout the night, easing up a little for a couple of hours, then pouring again. The rain has stopped by the time I woke up around noon, but the sky was still filled with gray clouds. Suffice to day that put a damper to my desire to explore, but when my growling stomach had me running to the nearby hawker stalls, I made sure to bring my camera and the Penang Heritage Trail maps. I wanted to get started on the buildings I missed during my first trip here, but I decided to just explore the neighborhood. 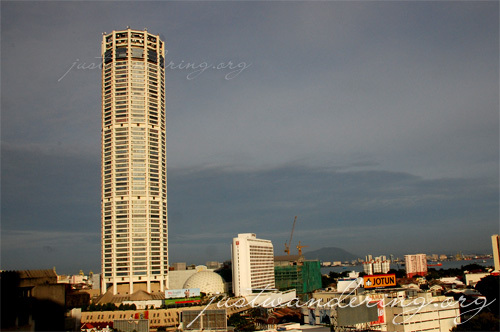 I’m staying at the Sunway Hotel Georgetown, just off MacAlister street. It’s a far cry from the places I usually stay at when I travel, but since I need to be online to work, I figured I’d shell out the extra money for a stable Internet connection. So far, Sunway’s broadband Internet hasn’t failed me. Yet. * I booked based on Martin’s (the Tourism Malaysia guy) recommendation, the promise of Internet, the price (admittedly, not as cheap as I would like), and the location. I just knew that the hotel is near Komtar, and that’s central enough for me. Much to my delight, New Lane is pretty much hawker street at night so I don’t have to go far for food. Somehow, I ended up at Prangin Mall instead of the museum. I wandered around aimlessly, ducking into random stores and stopping myself from buying more useless knick-knacks. When I emerged from the mall, the gray clouds have started to clear, and blue skies emerged. I walked back to Jalan MacAlister to see what else is in the vicinity. 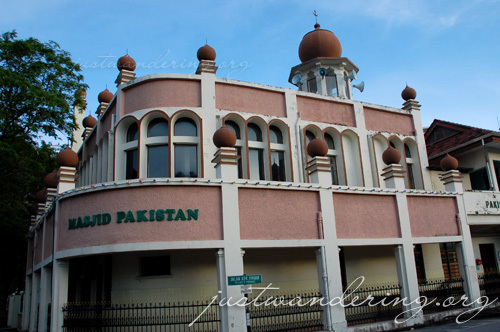 In my short walk, I came across Hindu temples, churches and a mosque. The interesting thing about the chuch was that at the gate, it says that there’s a Filipino service every Sunday, which makes me wonder if there’s a Filipino community in Penang. In the course of my walk, I ended up in front of the the Sun Yat-Sen Memorial Centre. I was deciding whether to go in or to continue walking, when I turned around and saw the Nasi Kandar Pelita right across the street. It’s the same restaurant as the one we had dinner at in Kuala Lumpur last September, and I was looking forward to having murtabak again. I went straight to the counter where the rotis are being cooked and placed my order. The restaurant was almost empty, as it was still too early for dinner. I settled for a table outside, enjoying the light breeze and marveling at the gorgeous blue sky. The table was right beside a busy street, filled with the rush hour traffic. Sitting there amidst all the noise and car exhaust, I felt surprisingly at peace. * Once in a while, connection with Gmail and Gtalk falters and I’m left unable to access my mail. But other than that, the Internet’s peachy. 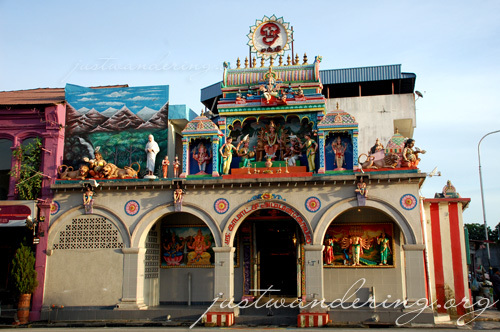 Although Penang is a World Heritage Site and Singapore isn’t, the two cities are very similar to me. The people more or less are from the same ethnic groups, they speak the same language/s and the architecture also won’t look out of place in either of the 2 cities. Added your blog to my blogroll by the way! Love reading your entries on places within Southeast Asia.